What landscape can one describe as the meeting place between artistic practice and political practice? Much of this data accounts for intentional earth-moving, as opposed to the unintentional effects of industrialization. Unintentional effects of transforming landscapes for industrial purposes include pollution, which impacts both humans and the environment. How do artists demonstrate these effects through photography? In what ways can an artist make visible the morphological transformations that bodies and landscapes undergo as a result of industry? Edward Burtynsky’s photograph, Nickel Tailings #30, Sudbury, Ontario, offers a glimpse into the geomorphological effects of industrial mining and intentional earth moving. Burtynsky’s photographic method is intentional as well — it is clear that this is not a natural landscape. The frame is dominated by a bright orange river of industrial waste, broken off into several smaller streams that fan out towards the viewer. 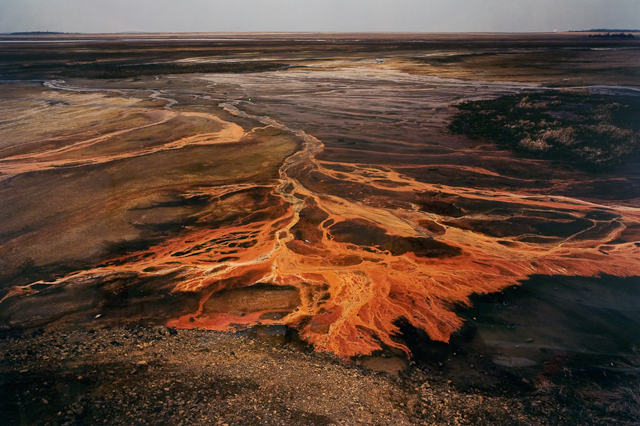 The vibrance of the tailings issues a stark contrast to the decimated pastoral landscape that surrounds it: the shores of the river of pollution are littered with rocks, and a strip of gray sky looms at the top of the photograph. All signs of life have been choked out by the refuse left behind after years of mining — there is nothing green in sight. Nickel Tailings #30 demonstrates tangible evidence of human intervention into the landscape alongside signs of its tragic transformation. 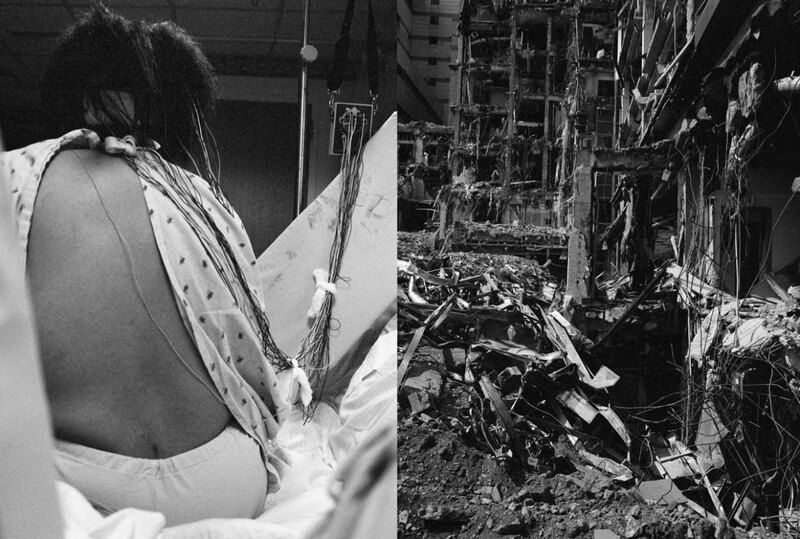 LaToya Ruby Frazier’s photographic diptych Landscape of the Body (Epilepsy Test) also draws attention to the morphological, post-industrial effects on the human body and its environment. The right side of the diptych shows a demolished building, the University of Pittsburgh Medical Center (UPMC) Braddock Hospital. On the left side, the viewer sees a woman, from behind, sitting on a hospital bed. Frazier’s diptych addresses the effects of shutting down the local hospital in the town of Braddock while simultaneously constructing a new facility in an affluent suburb of Pittsburgh.3 Frazier uses the stories of three generations of women – her grandmother, her mother, and herself – to expose the effects of urban decay on her community. All three women have suffered from illnesses that Frazier attributes to pollution.4 Because there is a human body included in the image, and particularly because the body is facing in the same direction as the viewer, we are able to place ourselves in the same frame. Nickel Tailings #30 calls attention to the effects of industrialization and pollution on the earth, bodies of water, and plant life. Landscape of the Body (Epilepsy Test) calls attention to the effects of industrial pollution on human bodies. Burtynsky’s photograph displays a ruined landscape, but not to directly indict the mining industry. Rather, the artist wants to document the transformation of a landscape into a scene that is both visually appealing and politically unsettling. In contrast, Frazier’s artwork appears to more deeply interrogate the unsettling transformations that occur in bodies and in environments as a result of industrial pollution. 1 Jacques Rancière, “The Art of the Possible: Fulvia Carnevale and John Kelsey in Conversation with Jacques Rancière,” Artforum, trans. Jeanine Herman (2007). 2 Roger LeB. Hooke, “On the History of Humans as Geomorphic Agents,” Geology 28, no. 9 (September 2000): 843-846. 3 “LaToya Ruby Frazier: WITNESS”, Contemporary Arts Museum Houston, 2013. http://camh.org/exhibitions/latoya-ruby-frazier-witness. 4 LaToya Ruby Frazier, The Notion of Family (New York: Aperture Foundation, 2014).